When I penned the groundbreaking book, Taxation Without Representation in 2008, I had read many of the founding documents of the United States. One of the first things that I did in preparation for the book was print a copy of the Constitution on 81/2 X 11 paper and take it with me on my first cruise. I was not sure what I really was going to do but like many Americans I was fed up with politics as usual. The Constitution is not an onerous document. It is much more readable than the type of gotcha bills coming out of Congress today. When I finished the book, I decided, among other founding documents to place the full text of the U.S. Constitution within the book as an appendix. Without you having to buy any of my books, (I also put it in my Obama's Seven Deadly Sins Book), I have also placed the full text of the U.S. Constitution right here in this article and at the end of this article, there is a URL so that you can go to a government Web site to see any of the founding documents. Enjoy the written voice of freedom, directly from the books. It is a great read. 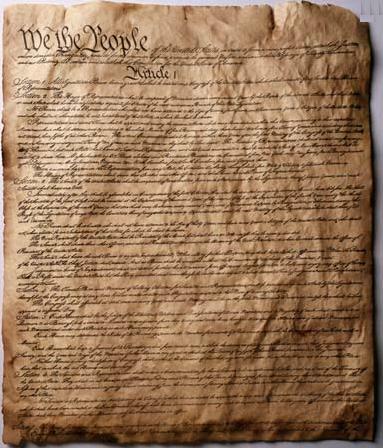 It is our US Constitution. Note: The following text is a transcription of the Constitution in its original form. Items that are hyperlinked have since been amended or superseded.